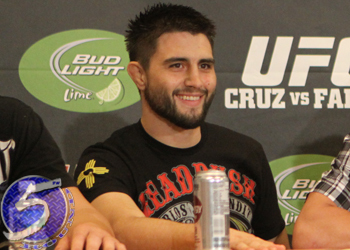 On Wednesday evening, First Round Management announced Carlos Condit (Pictured) has inked a multi-fight contract extension to remain with the UFC. Terms of the deal were not disclosed. “The Natural Born Killer” owns an impressive 27-5 professional record and became one of the hottest names in the welterweight division after shoving his knee in Dong Hyun Kim’s face at UFC 132. The former WEC champion has won 12 of his last 13 contests and is currently enjoying a four-fight winning streak. Condit meets BJ Penn in a pivotal scrap at UFC 137 on October 29th. The 170-pounders will co-headline the pay-per-view broadcast.